Kitchen Plaque Pair, Coffee Grinder and Stove - 560 Discounts Apply ! 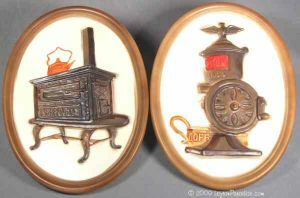 A lovely pair of oval plaques depicting a coffee grinder and cast-iron stove. Marked 560 and each is 9½ inches tall. They have no flaws.